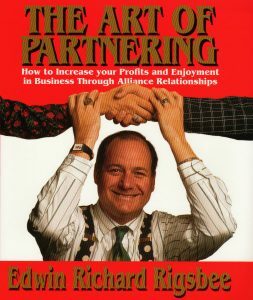 Ed Rigsbee was an early author on the topic of partnering success. 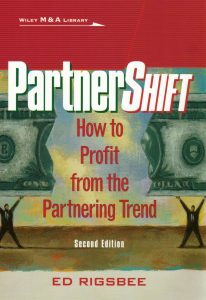 His first book, “The Art of Partnering” was published in 1994. 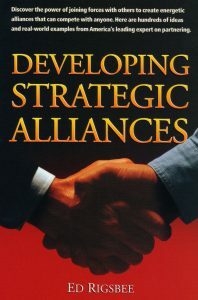 His second, “Developing Strategic Alliances” was published in 1999, and his third, “PartnerShift” in 2000. He has continued to write on the topic, deliver keynotes and workshops, and consult with corporations and non-profits. Partnering as your management strategy, you’ll need to understand the Partnering Pentad (group of five). To give you a visual, see in your mind a five-leg star and each of the areas below represent a leg. The Synergistic Alliance is what many consider Partnering and simply stop here. This is the leg of your business where you develop external alliances with others. These could include: purchasing, R&D, manufacturing, employee sharing, distribution, marketing, advertising and the list continues. By sharing your core strengths with others and theirs with you, both can create an environment of synergy. Partnering with your suppliers is essential for companies wanting just-in-time manufacturing (JIT) and electronic data interchange (EDI). I frequently here suppliers making this comment about their customers, “They’re talking marriage but acting one night stand.” Whether you’re a dealer, distributor, or manufacturer, you had better start developing long-term relationships. Partnering with your customers is the leg of outward focus. You must be customer/market driven rather than product/service driven to understand what your customers want. Your customers will spend if they feel they’re receiving good value. This is crucial if you are interested in Integrated Supply. Partnering with your employees, to many businesses is a non-issue, meaning that they don’t. If you want your employees to have Emotional Ownership in the success of your business, you must create a climate of empowerment for them. Empowerment means giving authority and encouragement. Then, employees will accept the responsibility. You, the Owner or Executive as the Optimal Partner. This is the final and arguably, the most important leg. Not from the perspective that all revolves around you, but rather that you determine your company’s culture. The coveted center of the star you are visualizing is reserved for the relationships that bind all the legs of the Partnering Pentad. If you think partnering success might be for you, selecting the right alliance partner is generally the difference between alliance failure and success. Be certain your alliance partner exhibits most of the following qualities. Wants to win. There is no reason to partner with a looser. A weak relationship will only bring you down. You and your partner must have a desire to win, to want to do better, to be useful in creating a synergistic relationship. Know they are ultimately responsible for their own success. Look for partners who understand the value of synergistic partnering relationships. While accountability goes both ways in partnering, in the end, we are each individually accountable for our own success. Is an active listener. To keep an alliance healthy, active listening is important. This helps each partner to know what the other needs. Alertness from both sides equals mutual success. Understands and cares about what drives their partner’s businesses. Each partner must do things that consistently give value to the relationship and their partner. The only way you can effectively add value to your partner’s business is to know what your partner considers valuable. Responds well to, and acts on feedback. To move forward, leaders must be willing to accept counsel. None of us know it all. Just think how special your partnering relationship would be if your partner never acted on your ideas. Flexible, especially when events or circumstances are not what was expected. If you, or your partner, don’t have the ability to change direction when the road ahead is washed out, failure is certain. Trust and integrity. Once the fabric of trust is ripped apart, although it may be repaired, the blemish will always show. You will always have it in your mind that it is not if, but when, they will do it to you again. Seeks win-win arrangements and solutions. You and your partner must believe that you are working toward a bigger pie, not just a bigger piece of the pie. Understands that partnering is a relationship of interdependence. It’s not about dependence or independence? Visualize your partner and yourself as partially overlapping circles. Great chemistry. If you like each other, you’ll work hard to overcome conflict and make your alliance work long-term. Now grade your potential partner in each area on a 1 to 10 scale, add it up and now you have a baseline potential partner grade. By the way, they should do the same on you. The greater the circles of interest overlap, the greater the value each sees in the relationship. Underestimating the complexity of coordinating and integrating corporate resources, and overestimating your partner’s abilities to achieve the end result. Situations where a customer is the driving force behind a partnering arrangement. Be sure to examine each proposal in the context of your company’s overall partnering strategy. Not having access to the employees of your alliance partners. The closer the planned relationship between the two companies, the greater the importance of the linkages between them. When a large company partners with a small, the interaction between companies becomes a challenge. Representatives of the small are usually top executives, but representatives from the giant must take a proposal up the chain of command. This policy can become frustrating for the small company. One partner not completely embracing the principles of partnering at the top level or even in departments, divisions or regions while the other does. Partners have different core values like trust and integrity or there are corporate culture clashes, employee turf protection, and resistance of some employees to new ideas, these issues can wreak havoc. Partners internal reward structure. In partnering with customers or suppliers traditional reward for buyers comes with wringing out concessions from the seller and by showing that their efforts had achieved cost reductions. On the flip side, sellers usually reward for sales performance. Having a third party that is not willing to playing ball. All the members of a partnering agreement will have to “give a little” for the agreement to work. If a partner receives unfavorable media coverage you are pulled into the picture. Real or perceived, image and reputation are critical to a company’s success. When sitting down at the partnering success table a partner might find the partnering seat uncomfortable. It could be that your partner has a different level of emotional and physical comfort, or sometimes it is simply a change in corporate strategy or a restructuring which leads away from a partner’s product and/or technology causing the partners distress. After making a partnering success commitment, a partner may have a hidden agenda or decide they don’t like or want to follow through with that which they committed, or does not have the capability to do what is necessary. Contracts with an overseas market, for instance, often take a long time to finalize. By the time you get going, in the technology industries, your competition may have already started. There can be difficulty in communicating across various time zones. Solving problems quickly when your partnering factory is located halfway around the world is hard enough when you speak the same language. Add the increased difficulty of language barriers, and major challenges can emanate from the alliance. The disloyalty that can occur when you try to partner with a potential or current customer and have them renege on the promise of purchasing from you after you have delivered complementary or introductory training. When unequal dependence in a relationship occurs, the partner with the least dependence could be less likely to compromise and expend energy into the relationship. Meanings assigned to words by different cultures can cause serious problems. Does quick delivery mean today, this week, this month or this year? Unrealistic expectations of any partner’s capabilities these areas include: technology, research, production skills, marketing might, and financial backing. Shall We Start The Partnering Process? For partnering success, both external and internal partnering are necessary in developing a complete management strategy. I call this Total Organizational Partnering. The Partnering Pentad (alliances, suppliers, customers, employees, and management) is the conduit, and will assist you to accomplish your partnering goals. Follow these steps to partnering success. Study your business, observe, and identify areas for improvement. Also, take inventory of core strengths that might be valuable to a potential alliance partner. Specifically, define what it is that you want and help others to define what they want and help them to achieve it as quickly as possible. For partnering success, study other industries that have embraced partnering along with the individual companies that have been successful with partnering. Study what worked and what did not. Learn about companies you might consider for partnering success arrangements. Look for arrangements that create a win-win result for all who participate. Ask yourself and your management team these questions: What are their strengths and weaknesses? What effect would they have on our business and vice versa? Be sure that the company cultures are complementary and that the people who will be in charge of the relationship can get along. This is the critical step. All your future efforts will be built on your selection. Search for the strongest alliance members for your partnering success foundation. Customer-oriented culture is critical to the success of the partnering alliance. The greater the sophistication of a company and its officers, the more likely a company will enter into partnering. Keep this in mind when making your selection. Embrace long-term thinking. Partnering is rarely a quick fix, but a sound long-term business strategy. Target companies, large or small, that can aid you in rapidly and efficiently, reaching the goals of research, technology, production and marketing. Now you’re to the point of identifying, understanding, and putting together the possibilities for your alliance. Work with internal and external personnel to develop not only your partnering structure, but also your road map. Success in blending of cultures is pivotal. Take great pains to insure this achievement. Access is crucial! Create a convenient communication system for all partners, especially decision makers. Plan procedures to keep relationships between key people of partnering companies open and constantly alive. Look into the future, plan for the long-term relationship and encourage strategies that will sustain the relationship through to its conclusion. Phasing in the partnering relationship could be a preferred strategy, as this method will allow partners to have a “get acquainted” time. This can assist in the identification of reaching milestones, successfully or identify the need to reassess before moving on to a higher level in the relationship. This is the agreement, whether it is a handshake or actual contract. Even so, I strongly urge all partnering alliances to put their agreements on paper. Having each alliance member’s commitment to the other on paper will smooth a path through the potholes of partnering. Also, your charter should explain conflict resolution. Being ready for conflict will make resolution more timely and amiably. Develop a clear agreement on what your goals are and make sure they are measurable for partnering success. Have a formal mechanism for alliance members to identify the goals, milestones, and turning points crucial to the success of the relationship. Devise some form of evaluation that will measure how well plans have been implemented. Additionally, consider having the partnering agreement include forms of dispute resolution for more formal arrangements, along with exit strategies as partnering safety valves. Regularly review your partnering efforts through value updates. Discuss the value you receive, the value you believe your partner receives and vice versa from the relationship. This will help in determining if relationships should be upgraded, maintained, or downgraded. Discuss opportunities for improvement and ways to enhance performance. What you really want to build is Outrageously Successful Relationships (OSRs) in all five Partnering Pentad areas. Again, this is Total Organizational Partnering. The benefits generally outweigh the pitfalls if you’re careful. The ability to successfully adopt the partnering paradigm philosophy is the first challenge of partnering. And, Partnering is only for the mature. Outrageously Successful Relationships (OSRs), for partnering success in business are based on the desire to create synergy between multiple entities. Five Partnering Core Values support the foundation of such relationships. To build OSRs, integrate the following five core values into your paradigm of operation and you will experience wizardry for yourself and others! This is having confidence, reliance or resting of the mind on the integrity, veracity, justice, friendship, or other sound principle of another person or thing. It’s also the glue that binds a relationship. For successful business relationships, trust is necessary to move from inertia to action. Trust is that wonderful, mystical and cherished virtue hoped for and shared among practitioners of what I call the Partnering Paradigm. In trust, you’re continually putting yourself at risk. It’s the process of taking risks necessary in building relationships. At times you are certain to be disappointed, but hopefully these disappointments will be few, compared to the availability of beneficial experiences. It’s unfortunate, but the words tolerance and understanding, have become a cliché that too easily rolls off the tongue in business conversations. For business OSRs to work, this core value must be cherished and practiced by all. When you can accept the value of an idea rather than be concerned by whose inspiration it was conceived, you would truly exhibit tolerance and understanding. In my relationship seminars, I lead an exercise where several people are standing in a circle, facing center, blindfolded, and holding a rope. Then I tell them to make a square. I use this exercise to show how much more is possible when participants work together rather than separately. This is only possible when they adopt an attitude of cooperation. During the rope exercise, it is always interesting who shows up as the leader to make the square. It’s not always the person who signs the paychecks. Growth is the natural outcropping of this exercise because participants see each other in a new light. Caring about a business relationship is essential in making a commitment to its success. This is what will usually smooth out the potholes on the road to OSRs. It’s this element that allows others to voice their opinion and remain safe from criticism. Additionally, there is also the commitment that is necessary to the function of leadership, and at times, the ability to follow when another is currently leading. Another important aspect of caring is to welcome and accept responsibility. Rather than saying, “You really should . . .” in OSR building it would be better to say, “This is what I think we need to do.” Then say, “If it is ok with you, I’ll take care of it.” In many businesses, idea people are a-dime a-dozen, but those who can implement are immeasurably valuable. OSR building must be an institution of trust, tolerance, understanding, cooperation, growth, caring, and commitment. This results in synergy and mutuality, similar to that of a successful marriage. Business OSRs have much in common with the institution of marriage. Both require all of the above, and both offer benefits that outdistance the possibilities available singularly. Build your OSRs and enjoy the partnering success benefits. Get even more ideas on partnering success by watching Ed’s interview at the Cisco.